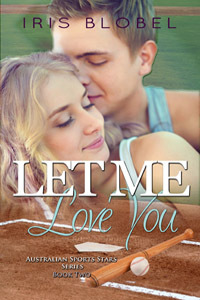 Today's featured book is Let Me Love You by Iris Blobel. But he keeps them at an arm's length, and when he meets Tamara, he's unprepared for the attraction he feels for her. Told by his coach that she's off limits, only draws him in more. It's Oliver's injury that brings them together, but as they find out about each other's pasts, how can they be ready to share a future? Iris Blobel was born and raised in Germany and only immigrated to Australia in the late 1990s. Having had the travel bug most of her life, Iris spent some time living in Scotland, London, as well as Canada where she met her husband. Her love for putting her stories onto paper only emerged a few years back, but now her laptop is a constant companion. Iris resides west of Melbourne with her husband and her beautiful two daughters as well as their dog. Next to her job at a private school, she also presents a German Program at the local Community Radio. Always a pleasure to be here! Thanks Kayelle.